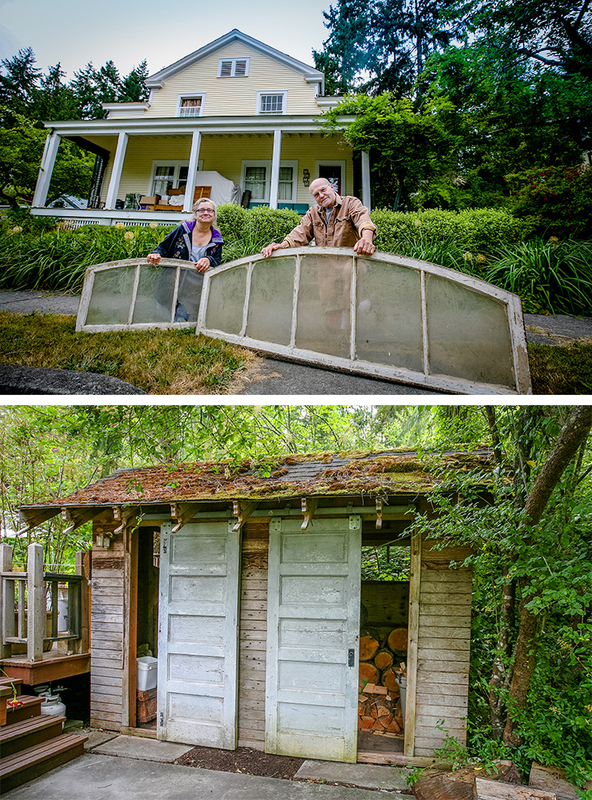 FORT WARD, BAINBRIDGE ISLAND – Some five decades after they were pulled out of the Fort Ward bakery’s facade and left for salvage, the original front doors and decorative “fanlight” windows have been found – in a garden shed and garage up the hill. The doors and windows will now be reunited with the historic bakery, as it is restored and reopened as Fort Ward Community Hall. Joyce and David Stettler with the Fort Ward bakery’s original fanlight windows, and the building’s original doors. The stout double-doors have been hanging on the garden shed of David and Joyce Stettler, who own one of the fort’s other historic buildings, a pre-World War I duplex built for non-commissioned Army officers on upper Parkview Drive. The fanlights have been stored in the Stettlers’ garage, half-forgotten behind a pile of lumber, waiting for the right project to come along. Now it has. A historical photo and front elevation show the bakery’s original doors and fanlight windows. Constructed in 1910, the bakery building on Evergreen Avenue is a vestige of Fort Ward’s first iteration as a US Army Coast Artillery Corps outpost at then-remote “Bean Point,” at the south end of Bainbridge Island. The original 1908 blueprints, drawn from the National Archives, show an industrial-sized oven in the bakery’s main room, with smaller rooms in the wings for proofing dough and cooling the finished loaves, and quarters for the baker. The Army traveled on its stomach even at station, so the bakery had a key role in keeping the post garrison well fed and morale high. “Post Baker” was an official title, whose holders were referred to by name on company rosters. The building was repurposed as a power station to support Naval cryptography operations through World War II. Young radiomen serving at what was by now known as Naval Radio Station Bainbridge Island intercepted Imperial Japanese military and diplomatic messages, relayed the coded information to Washington DC, and helped win the war in the Pacific. When the fort was decommissioned around 1960 and mostly sold off to private interests, the bakery story entered its third chapter: as a private home. Historical photos show that the original doors and fanlights were in place at least until 1960 after the Navy moved out, but had disappeared by the mid-1970s. Somewhere in that timeframe, a homeowner raised the floor 3 feet to install a furnace and ductwork underneath. The towering front doors and curved windows above were removed to allow shorter fixtures, and the front porch was eventually enclosed, obscuring the changes. The Fort Ward bakery today. Fort Ward at that point was something of a “ghost town,” with the ruins of many old military buildings dotting the landscape and a lot of salvage around for the taking. That was true even into the 1990s, when the Stettlers moved to Fort Ward from Seattle and began restoring the former Army duplex – a project that, like many such renovations, continues into the present. As the Stettlers tell it, they befriended neighbor John Maggiora, who owned the bakery building and several adjacent parcels. Maggiora still had the bakery’s old doors and fanlights sitting in a storage shed, or perhaps another old Navy building nearby – memories have faded a bit with time – and gave them to David Stettler, who had an eye toward a future project on his own property. The doors wound up on his garden shed. The fanlights spent the next 20 years gathering dust. While the Stettlers had been generally aware of the bakery restoration campaign, recent newspaper coverage inspired them to come forward to see if the old fixtures were wanted. David Stettler contacted Friends of Fort Ward and announced that he had the bakery’s original front doors, and would anyone like to see them? Sure enough, his shed doors were an exact match for the dimensions shown in the bakery blueprints – five-paneled fir slabs measuring 90 inches high, 36 inches wide, and 2-1/4 inches thick. That, and the apparent chain of title, were sufficient provenance: these were the same doors in the old photos. That’s when the conversation took a more astounding turn. The gently-curving fanlights were an exact match for the blueprints – the larger one measuring 72 inches wide for the arch above the double doors, the smaller one sized for a doorway in the northwest corner of the facade. Considering their age – 107 years old – and peripatetic journey into the present, the windows were remarkably well preserved. They had obviously been removed and treated with care over the years, their sashes still in good shape and with only a single broken pane. Historians are elated with the news. “A remarkable find,” said David M. Hansen, retired Washington state historic preservation officer and author of “Battle Ready,” an authoritative history of the Puget Sound coast defense network. 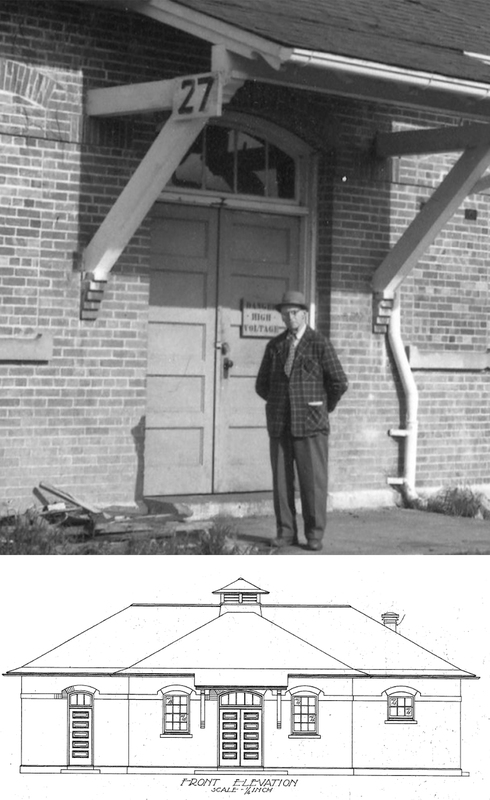 It was Hansen, now of Olympia, who got Fort Ward placed on the National Register of Historic Places in 1976, and whose photographic survey at that time provided more clues to how the bakery had been changed through the years. Vann, who works in the state Department of Archaeology and Historic Preservation, has followed the Fort Ward bakery restoration effort for the past year and visited Bainbridge in February to tour the building. He described historic preservation as “a tangible connection to the past,” with the stories of heritage sites best conveyed through authenticity and original materials whenever possible. Notice from the Seattle Daily Times, April 28, 1909, soliciting bids from area contractors for the construction of Fort Ward. With a distinctive white cupola at its crown, the Fort Ward bakery reflects the Georgian Colonial Revival stylings that define the Puget Sound’s early 20th century, “Endicott Era” installations, including forts Worden (Port Townsend), Casey (Whidbey Island) and Flagler (Marrowstone Island). A recent article in Coast Defense Journal noted that the Army’s Quartermaster Corps had hundreds of standardized plans for all manner of “non-tactical” buildings – from barracks to mess halls, fire stations to balloon hangars – that could be re-used from one fort to the next. While it’s unclear how many the Army built using “Plan No. 217, Bakery,” only one other is known to be extant, at Fort DuPont, Delaware. Architectural uniqueness is true across Fort Ward. Hansen has noted that with the exception of the NCO quarters and barracks (the latter torn down in the 1980s), Fort Ward’s buildings were not duplicated at any of Puget Sound’s other forts. 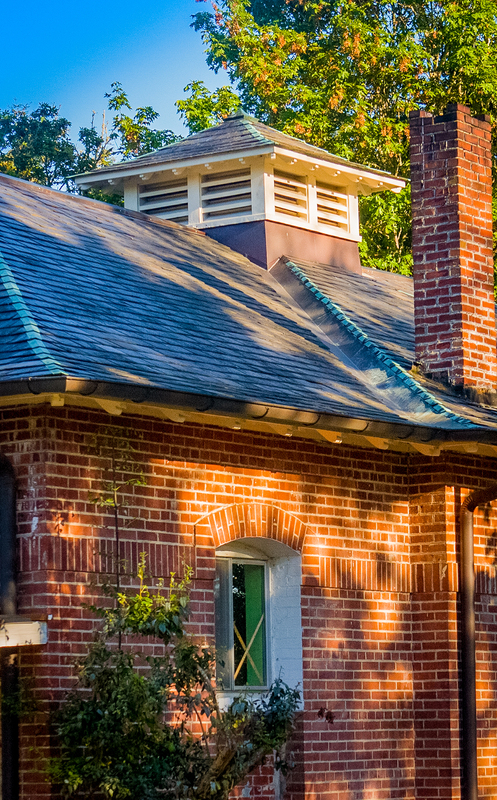 Details of the bakery’s architectural features including the cupola, brick accents and scrollwork in the eaves. Fort Ward also got all the brick buildings – surprising, Hansen noted, since when the fort was built, the newly rebuilt Port Blakely Mill was churning out marketable timber by the shipload just down the hill. That distinctiveness is embodied in the bakery’s design. Ironically, most of Fort Ward’s pre-World War I buildings are still standing – generally converted to private homes – while most of those put up by the Navy during World War II can today only be found in old photos. It’s a testament to the designs of the Army architects, and the materials and craftsmanship of the local builders hired by the Quartermaster Corps. 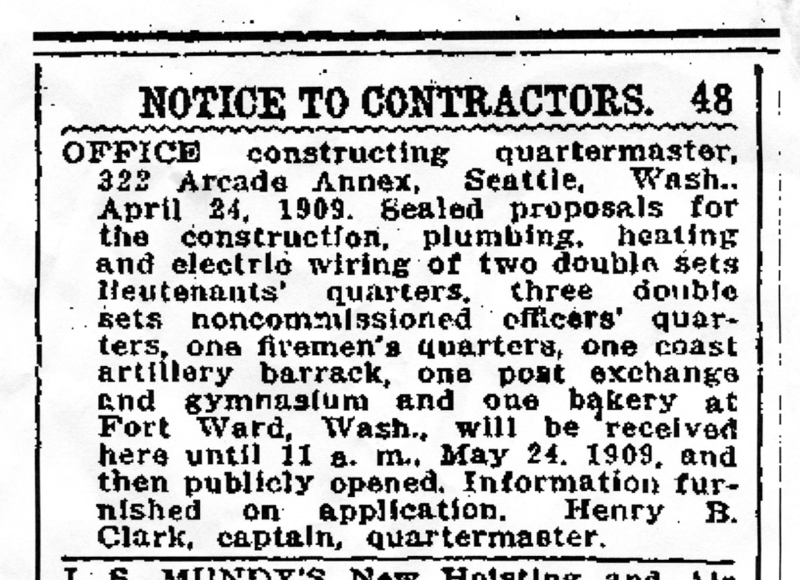 A “Notice to Contractors” in the Seattle Daily Times dated April 28, 1909, solicited bids from area builders to construct Fort Ward from the ground up, including the bakery, the Stettlers’ NCO quarters, and various other post structures. All but one still stand. The bakery is now the subject of a restoration effort by the Friends of Fort Ward neighborhood group, in partnership with the Bainbridge Island Metro Park District and Kitsap County (Fort Ward) Sewer District No. 7, which bought the building in 2007. The Wenzlau Architects firm is providing design services. The renovation will correct changes made over the years, taking the building back to its original 1910 look and feel. Windows bricked over by the Navy will be reopened to their full depth, and the elegant, original façade restored. The floor will be lowered back to grade, and a tumbledown carport and other add-ons removed. The main hall where the post baker once toiled next to a hot oven will be opened up for classes, meetings and youth activities, with a kitchen, restrooms and storage adjacent. The Sewer District will maintain a small office in the north wing. The hall will be managed by the Park District, joining Seabold and Island Center halls and Camp Yeomalt as local heritage buildings under public stewardship. Vann’s office has endorsed the project, and it is currently ranked No. 6 out of 35 sites statewide recommended for support under the state’s Heritage Capital Projects Fund. Fundraising is ongoing, but the project is in the final stages of permitting and building renovation is expected to begin later this summer – now, thanks to the neighbors, with some original fixtures. The Stettlers have donated the fanlights to the bakery restoration free of charge. As for the double doors, they are handing those over as well – although David has asked that Friends of Fort Ward get him two doors for his shed in trade.